Sherlock Holmes was always a modern man – it’s the world that got old. Co-created by Steven Moffat and Mark Gatiss, Sherlock is back as he should be: edgy, contemporary, difficult and dangerous. Sherlock can tell a software designer by his tie or an airline pilot by his thumb; he has a unique analytical brain unlike anyone else in the world and has found the best way to stave off boredom is by solving crimes. When a chance encounter brings soldier John Watson into Sherlock’s life, it’s apparent the two men couldn’t be more different, but Sherlock’s intellect coupled with John’s pragmatism soon forges an unbreakable alliance as they investigate a series of baffling cases together. Drama starring Benedict Cumberbatch and Martin Freeman. 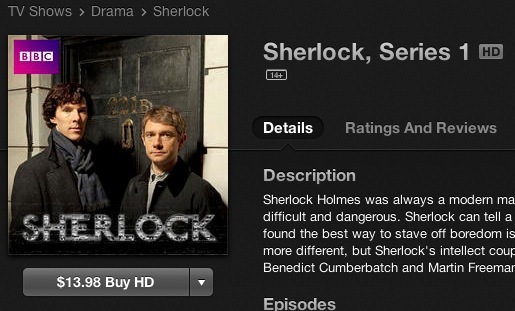 This looks to be a worthy download as reviews in iTunes describe it as a well produced show. Let us know what you think of it! Click here to hit up Sherlock, Series 1 and get your free episode.